It’s not perfect, but Navdy is a glimpse of how the future of in-car driving should look – and you can get it now! We’re always on the hunt for the next big thing – tech that could potentially change our lives for the better – and we might’ve just found it. Cue Navdy, a gadget for people who love driving cars. 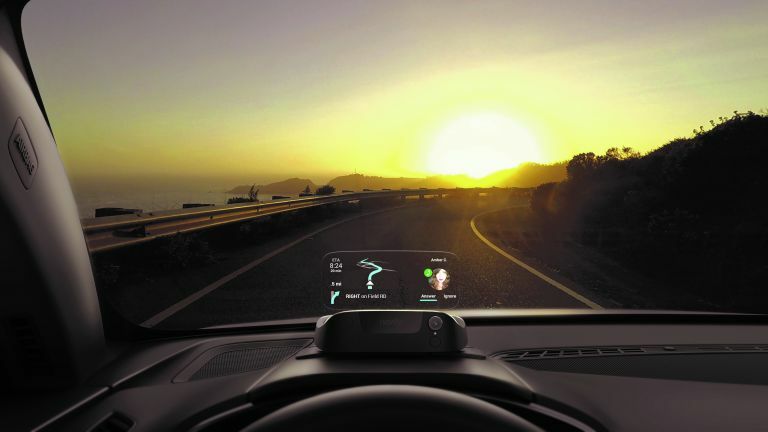 Billed as the world’s first augmented driving device (or a heads-up display, as we prefer to call it), Navdy mounts on your dash and projects a display onto a transparent screen in your line of sight, enabling you to see crucial driving data – think speed, navigation and more – with just a glance. But why would you want that? Well, for one, it should make it quicker and easier to see what’s going on, and this should make for safer driving. And since Navdy is a hands-free system, it’s legal to use, too, meaning you won’t get a painful fine and penalty points slapped onto your licence for brandishing your phone mid-drive. That all sounds good, but we wouldn’t blame you for thinking that something this hi-tech is the reserve of the rich and famous. Not so – you can install Navdy in almost any car, new or (relatively) old. All your car needs is an OBD-II port – a standard feature on all cars built after 2001 for petrol engines, and 2004 for diesel. Installing Navdy is straightforward – download the app, enter your vehicle’s make and model, and it’ll show you where to plug in the connector. Then find a space on the dash behind your steering wheel to attach the mount, and snap the heads-up display in place with its magnetic connector. Once you’ve paired your phone to Navdy, it’ll automatically recognise it thereafter. All good, then, but there’s one minor caveat: Navdy is better if you have a car stereo with Bluetooth. This enables you to hook up your phone, and Navdy, to pipe sounds – such as voice guidance and music – through your speakers. It’s not a deal breaker, as you could just use your phone’s built-in speaker, but it’s certainly something to bear in mind if the most modern thing about your in-car entertainment is FM radio. By owning a Navdy, you can bring an ordinary car kicking and screaming into the modern day, without it looking like you ram-raided a Halfords store. But with an asking price of £599, is it really worth having? With a degree of scepticism, you might think Navdy is just a glorified sat nav – but it can do so much more. The most obvious of these features is the heads-up display. By projecting an image onto a transparent screen, you can see all of your driving data without taking your eyes off the wheel. It can, occasionally, distract if you’re playing with the settings, because, even with the smallest of glances, your attention isn’t fully focused. But used sensibly, it makes for a safer drive. The Navdy Dial – a steering-wheelmounted remote – adds to this ease of use. Placed within reach of your thumb, the remote’s circular dial and single button enable you to navigate Navdy’s menu quickly. A single press of the button selects an option, while a double press brings up your last-used app in the side screen. Getting it all to work together seamlessly can take several hours of driving, but once you get the hang of it, it’s very intuitive. The real party piece of Navdy’s interface is gesture control. Whenever you receive a call or message, simply wave your hand left to accept it, or right to reject it. If you like to keep connected to your phone at all times while you drive, but you don’t want to be one of those phone-in-hand jerks, this is invaluable. It’s just a shame the use of gestures isn’t more widespread, as it’s such an intuitive action. While gestures will only work with specific notifications, Navdy can display more. Go into the Navdy app and you can choose which alerts – Glances, as Navdy calls them – you want to see. You can get updates from umpteen apps, such as breaking tweets and even eBay notifications. Some might say this is overkill, but you can always choose how much to see. If you get bored of using gestures, you can always tap into Navdy’s voice control, whether it’s Siri or Google Now – just long-press the steeringwheel button and ask Navdy to call or text someone. It works well, unless you’ve got a face-full of Greggs. You can also control how you receive notifications – whether it’s reading the content aloud, only displaying it on screen, or both. We found that going for voice only makes it easy to handle a large number of notifications while driving. Controlling each notification wasn’t always straightforward, though; occasionally, you’d dismiss one, only for it to pop back up again seconds later. Considering the small screen on offer, Navdy is able to display quite a lot of information. The speedometer and rev counter get pride of place in the centre, naturally, while the left and right side show different kinds of driving data, such as date, MPG and fuel remaining; and you can scroll through them using the circular wheel. You can also adjust each side independently of the other, which enables you to change what you see on screen – though swapping sides is trickier to do, requiring a few button presses within the menu. The right side also serves as a space for new notifications and quick controls, enabling you to control what you see. No driving companion worth its salt would be complete without the offering of route guidance, and Navdy does just that. Routes can only be started from the phone – which is somewhat annoying if you want to drive to a new route without pulling over. When navigation starts, the screen changes to a 3D map, your current route highlighted in blue. Your speedo remains in the corner of the screen, or you can choose the standard view, relegating the navigation particulars to a side screen – still useable but less intrusive. Navigation is basic; you get neat features like being able to search for nearby points of interest, which Navdy will take you to (though results were limited). Navdy will also navigate you to a fuel stop when your tank gets low. But overall, it lacks polish compared with standalone sat navs. Even Google Maps is more substantial. Elsewhere, Navdy’s most promising function is its ability to play music from your phone. Presently, a plethora of music apps are officially supported, including iTunes and Spotify, and Navdy will, in theory, support thirdparty apps by virtue of the Bluetooth connection piping tunes through your speakers, but you won’t be able to actually control the music. The interface is rather rudimentary – there’s play and pause, and you can skip forward a track using the control wheel. Navdy will also show you the album artwork in the quick-launch screen, but you can’t actually browse your music library or, heaven forbid, choose a song you like. Until Navdy broadens the functionality of its music interface, you’ll need a substantial playlist for those epic road trips. Navdy’s screen looks impressive, but when you’ve been staring at a 557ppi screen on your Galaxy S7 all day, you can’t help but feel it could be crisper around the edges. The bright, bold screen is easy to read, day or night (eye-searing conditions notwithstanding). Navdy has catered for folks of all sizes, with a choice of three mounts to raise or lower it. Annoyingly, the taller mounts make Navdy wobble slightly while driving, meaning the display vibrates just a touch. The standard mount is rocksolid, though. Short people win. So Navdy isn’t without its foibles, then. Does that make it an overpriced in-car gadget; a solution to a problem that doesn’t exist? After all, most modern cars these days are already equipped with satellite navigation and a media player – and, heck, you could just look at your dashboard if you need to know how fast you’re going. We say no. Though there’s no doubt the firmware needs beefing up to make it a more complete package, Navdy offers something genuinely unique. The standout feature here is undoubtedly the heads-up display, which beams data right into your view. It’s supremely slick and when you add up all its capabilities, you realise just how invaluable it is; and that once you start using it, you won’t be able to do without it – especially if you drive lots of miles. Navdy makes driving safer and, ultimately, more enjoyable.